We know that acne can leave more than physical marks on your face and body; it can have a significant impact on your self-esteem and confidence level. That’s why acne treatment is such a special area of focus and concern for us at the Medical Rejuvenation Centre. To treat acne, we rely on multiple forms of treatment. There is no one miracle approach, but our programs designed specifically for each patient, yield great results. Visibly reduced pock marks after treatment. There are many types of acne, the most common being, “acne Vulgaris.” Just beneath the surface of the skin lie hundreds of tiny glands called “sebaceous glands”. Their function is to collect and excrete “sebum” (an oily substance produced to keep the skin in a healthy state). The tiny pathways where the sebum is excreted, often become clogged, and a type of bacteria called P. Acnes begins to grow. In a short time, the area swells up and forms what we know as a pimple on the skin’s surface. Most people experience the development of acne at some point in their lives. In some cases, this process becomes very active, making the acne troublesome and hard to control. Excessive sweating from vigorous work, sports, sauna, etc. Diet: Some patients are bothered by caffeine (coffee, tea, coke, chocolate), nuts, peanut butter, fried, greasy or fast foods, dairy products (butter, milk, cheese, eggs, ice cream), salt, pastry, and beer. If you suspect a food, eliminate it for a four-week trial period. Aggressive skin cleansing with pads, brushes, sandy soaps, and face cloths. Acne is characterized by: comedones (blackheads or whiteheads), papules, pustules, cysts, and nodules. It affects mainly the face, chest, back, and shoulders. If the acne is left untreated, or if picked or treated inappropriately, permanent scars may result. 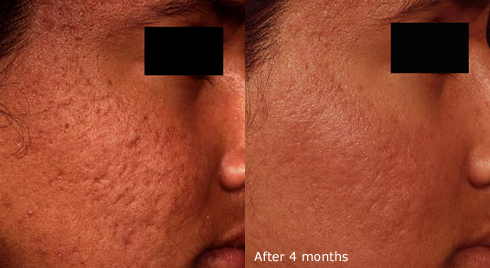 Waiting to outgrow acne without treatment can be a serious mistake. Topical cleansers, toners, serums and lotions: These products usually contain salicylic acid and benzoyl peroxide. Chemical peels: The most common acids used for this treatment are alpha hydroxyl acids (AHA’s) and beta hydroxy acids (BHA’s), such as Glycolic, Lactic, Tartoril, and Salicylic. There are different reasons why patients and doctors are become frustrated with standard treatments. Doctors may decide that certain medications, such as antibiotics, are not suitable for their patients. Your case of moderate acne may not be responding to medications or to other conventional treatments. It may be hard for you to keep up with complicated skin care routines. We invite you to book a skin consultation to discuss a treatment plan that would be most beneficial for you.